Masses with the Pope at the Vatican can be celebrated in St. Peter's Basilica, in St Peter's Square or both together depending on the celebration and the expected number of people attending. Most of the masses from the Pontifical liturgical calendar at are celebrated at St Peters Basilica. St Peter's Basilica has a huge capacity and can easily host more than 15.000 people which seems big enough for most of the Papal Masses. However there are some Masses when the Holy See is expecting a larger number of people and for those Masses they will use St Peters Square. For more details please see below " Masses at St Peters Square". Normally the Holy see issues different kind of tickets for St Peters Basilica Masses. Tickets for Cardinals, Governors and Diplomats ,Bishops, Priests, special guests and public tickets. For most of the Masses with the Pope you will need to have a ticket. 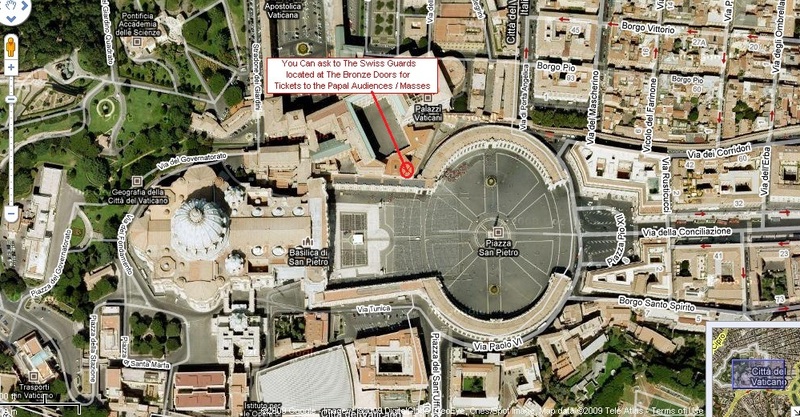 If you have a regular ticket to participate in a Papal Mass and you are looking for a good close up picture of the Pope or a location close to the Altar you will need to arrive early to the Mass. Don't forget that to attend these celebrations you will need to pass through security scanners (like the airport) and long lines are to be expected. We recommend you if you have a regular public ticket and you are looking for a good place to arrive 1- 3 hrs before the scheduled start time. However if it's a Popular Mass such as Christmas Eve or Easter Mass you will need to reserve tickets in advance to guarantee availability. If the mass is celebrated in St Peter's Square, the number accommodated is much larger than the Church. St Peter's Square can host up to 80 000 people. So normally for the seated area you will need a ticket but mostly you can attend standing without a ticket. However there are big Masses such as important canonizations or the Urbi et Orbi blessing than attract huge numbers and St Peter's Square is not big enough. Again, places will only be be guaranteed according your arrival time. The tickets will be asked for at the entrance of the Mass. Tickets DOES NOT necessarily guarantee entrance or a seat. When the church / Square is full access will be denied even with your ticket. Only your arrival time will guarantee your access so come early. These tickets giving you a special location at the event or Mass with the Pope. Normally these tickets are reserved only for religious guest, goverment authorities through a reservation applied though the church or any other religious institution. Easter Masses & Christmas Eve Masses are traditionally celebrated at St Peter's Basilica. The best way to get your ticket for Easter/Christmas Masses is to send a fax from your country directly to the Vatican between 6 to 2 months in advance. If the number of your request is not very large, lets say a family numbering 2-6 tickets you will have a bigger chance of getting your tickets. Normally the Vatican will reply to your home address with a letter notifying you that they have received your request and where to take the letter at the Vatican to collect tickets. They will not confirm tickets have been issued until you go to the prefecture office for collection. There you will either receive your tickets or a letter to say there was not enough availability. Again, the sooner you make you reservation the more chance there is of availability. The smaller the number of tickets requested the higher the chance of having your request granted so we suggest don't book extra tickets unnecessarily. If you order a large number of tickets such a group or more than 10 tickets we recommend you to send the request together with a letter of your parish or some authority of the church. TICKETS ARE ALWAYS FREE !! !